1 oz (20 g) fresh coriander (or other spice). Put the noodles into 1 quart(1 liter) water with 1 tbsp salt. Drain the hot off and cover the noodles with plenty of cold water. Take it out of the pan and let the water drip off. The vegetables must all have the same length to get a nice even roll. The length should preferably be approx. half the diameter of the roll. 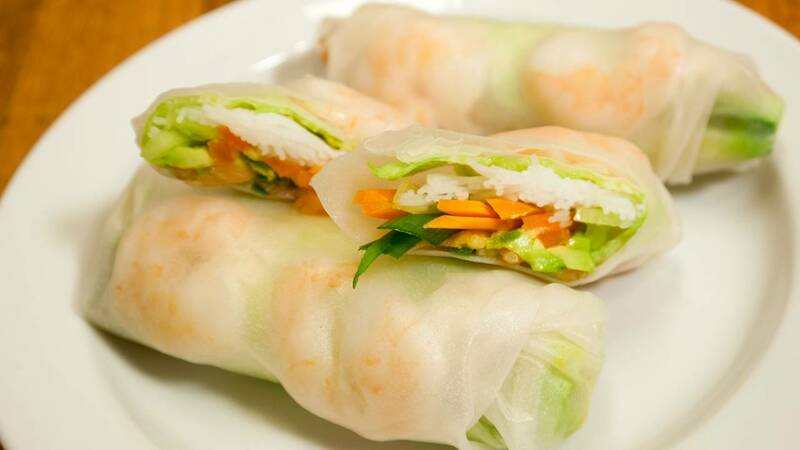 So with 8½ inch (22 cm) rice paper they should be about 4 iches (10 cm long). I typically cut the cucumber exactly, and then use a piece of that to measure where to cut the other vegetables. 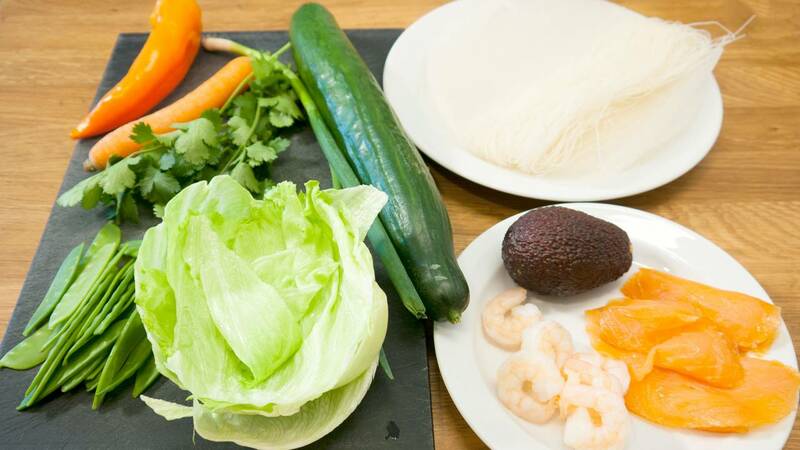 The vegetables must be cut into as thin strips as possible. The iceberg salad leaves should be cut in 4 inch (10 cm) wide pieces, just like the rest of the vegetables, and be approx 2 inches (5 cm) long. Cut the avocado into thin slices so that it does not break easily when you put it into the roll. Cut the smoked salmon into 4 inch x 4 inch (10 cm x 10 cm) squares. Normally that is the the size of one half slice of smoked salmon. Cut the shrimp over in the middle lengthwise, so you get two equal halves. 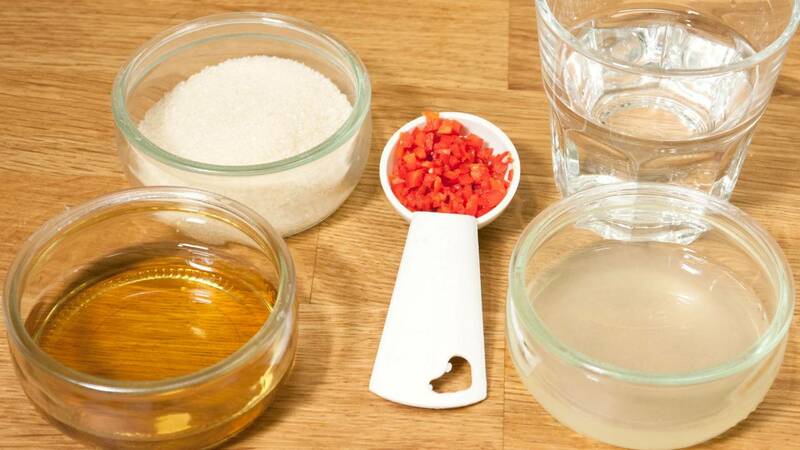 Fill a flat plate with as much water as possible. Dip the rice paper in the water. They must be completely soaked. Place it on a plate without water. It does not have to be dry, it should just not be full of water. When it has been lying there for a couple of minutes and has become soft, then put it on a cutting board. a piece of iceberg salad at the bottom. If you cook the tiger prawns yourself, boil them just until they change color. Not more than a few minutes. I usually use 1 dish of water and 2 "waiting plates" for rice the paper. 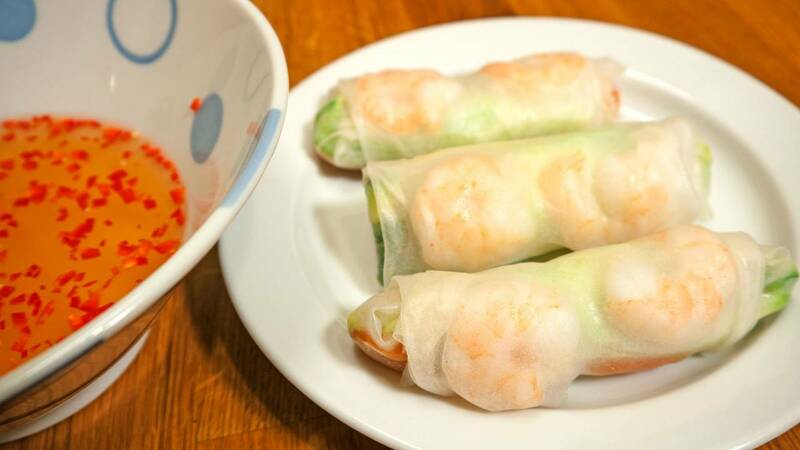 I dip the rice paper and lay it on a "waiting plate" . When a piece of rice paper has become soft enough I lay it on a cutting board, and before I fill it, I dip a new piece of rice paper and put it on the empty "waiting plate". That way, a piece of soft rice paper is always ready to be folded. 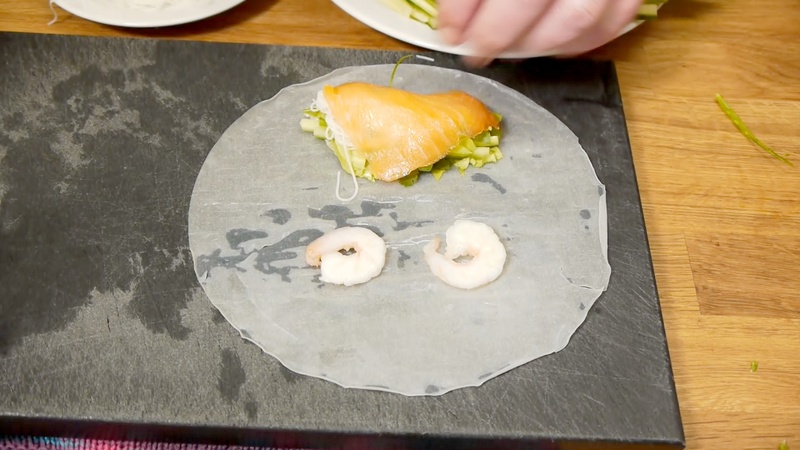 The paper can be too soft if it's waiting too long, so until you've learned the technique and tried it a few times you can drop the cutting board and roll them directly on your "waiting plate" . 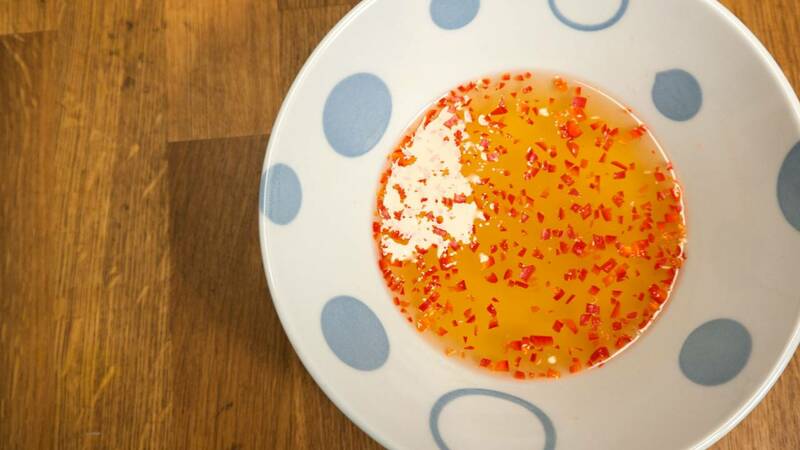 It may be a good idea to start with the dipping sauce, so the sugar has time to dissolve. Alternatively you can use syrup instead of sugar. Then it is no problem. The smoked salmon is not classic Vietnamese, but I think it's very easy and gives a good strong taste. All kinds of fish or seafood are fine. You can make it vegetarian and drop the meat filling. Instead you can use fried oyster mushroom in thin slices. I have often seen the classic Vietnamese version with boiled pork in thin slices. If you feel lazy you can just buy sliced ​​cooked ham. Cooked chicken or duck is also perfect. 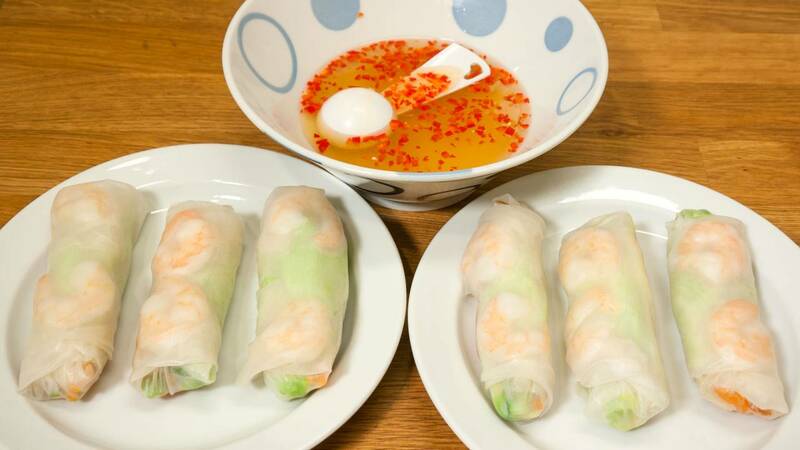 It is also very common to put some oyster sauce in the roll too.